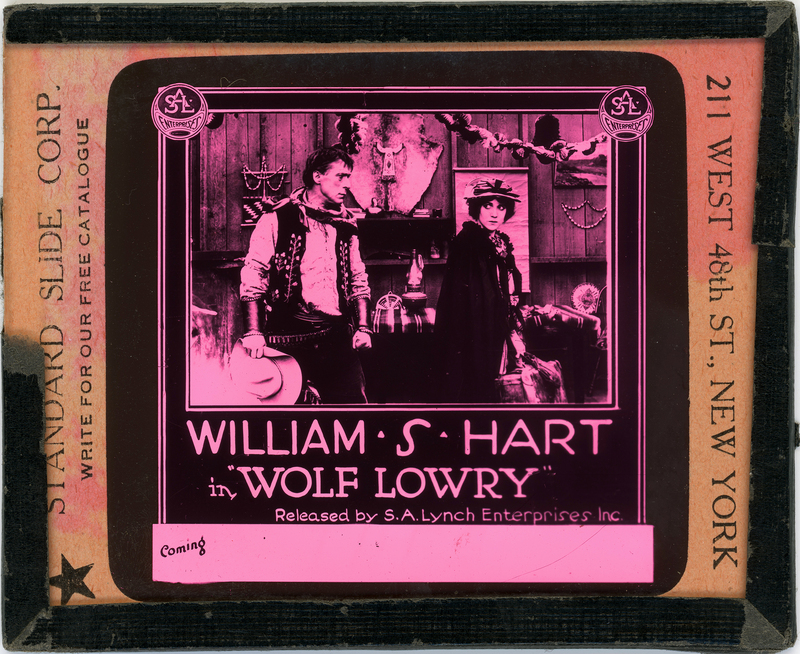 SCVHistory.com LW3298 | William S. Hart | Lantern Slide: 'Wolf Lowry,' Kay-Bee/Triangle 1917. William S. Hart stars with Margery Wilson in the 1917 Kay-Bee (Thomas Ince) production of "Wolf Lowry" for Triangle Film Corp. Nowhere does this magic lantern slide say Kay-Bee or Triangle. Instead it says S.A. Lynch Enterprises Inc., indicating an original release (May 27, 1917) in the southeastern United States. Stephen A. Lynch was one of the vultures who swooped in when Harry E. Aitken decided in 1916 to spin off Triangle Film Corp.'s distribution activities into a separate company that would bring in it own investors, enabling Aitken to pay Triangle's many creditors and continue delivering new product. In view of all the romantic hokum that has been passed off concerning the early days of movie making, it is often difficult to accept the fact that the motion picture industry had its own versions of Al Capone and Dutch Schultz, long before prohibition brought national notoriety to hoodlums of this kind. But Stephen A. Lynch personified this exact concept and exhibitors in the southeastern United States who had occasion to come into business contact with Lynch in the 1914-18 period still turn livid with rage at the mere mention of his name, even after more than a half-century. From his headquarters in Asheville, North Carolina, Lynch had built up control over a chain of about thirty theaters in the principal cities of the Carolinas, Georgia, Alabama and Florida, forming the S. A. Lynch Enterprises. A measure of respectability had been granted his activities earlier, in the form of an appointment ... as the sole southeastern distributor of Paramount Pictures, and Lynch took full measure of this valuable distribution franchise to parlay his theater chain into a position of almost unlimited power in the exhibition field. Lynch and his stooges would move into a city or town and approach the local theater owner with a proposition to play Paramount product, usually at a price considerably above what the exhibitor was paying for competing product. If the exhibitor bought the package with no questions, all went well, but if he refused or played coy, hoping to strike a better bargain, Lynch or his operatives dropped open threats to build or buy a theater which would then play Paramount films, undercutting admissions and running the recalcitrant exhibitor out of business. If an exhibitor refused to knuckle under at this point, the unhappy theater man who had faced up to Lynch usually found his business establishment destroyed by dynamite in the dark of night, or literally torn apart by a rowdy crowd hired to do just that. Paramount pictures would span the earth, even if Lynch had to oversee the delivery of each one personally. Although only one of a number who used such tactics in attempting to gain an exhibition monopoly for Paramount (and for themselves as regional distributors) around the country, Lynch was perhaps the most energetic and certainly the most notorious, delivering the greatest number of contracts to Paramount. So Lynch started buying up Triangle Distributing Corp. stock, and in no time his own company, S.A Lynch Enterprises, was a major shareholder. His company "was granted the distribution franchise for the southeastern United States, much as it had for Paramount earlier, and the Triangle product which played this geographical area had its Triangle titles removed and replaced by 'S.A. Lynch Enterprises Presents'" (ibid:171). "Aitken, who had concluded that his problems were nearly over when Triangle Distributing was formed, now found that his bad dreams had suddenly become nightmares of the first order; Lynch was all over the place, asking embarrassing questions and plaguing the promoter for profits — profits which Harry could not have delivered even had he wanted to" (ibid:172-173). "Wolf Lowry" was Bill Hart's second-to-last film for Triangle, whose financial troubles he felt. Aitken agreed to raise his salary to $10,000 per week but didn't follow through. Then Ince decided to split from Aitken. Ince jumped to Artcraft (a part of Famous Players) where Adolph Zukor garanteed Hart $150,000 per picture plus a percentage of the profits, which Hart and Ince would share (Davis 2003:90-94). That arrangement ultimately led to animosity (and a court battle) between Hart and Ince, but that's another story. Prints of "Wolf Lowry" exist in the Library of Congress and elsewhere, but it does not appear to have been re-released in modern times. It was probably filmed at Ince's studio in Santa Ynez Canyon, between Santa Monica and Malibu. Produced by Triangle/Kay-Bee under the supervision of Thomas H. Ince; distributed by Triangle; in production February 3-March 21, 1917; released May 27, 1917; five reels. Directed by William S. Hart; screenplay by Lambert Hillyer from "The Rancher" by Charles Turner Dazey; photographed by Joe August; art director, Robert Brunton; assistant director, Cliff Smith. CAST: William S. Hart (Tom "Wolf" Lowry); Margery Wilson (Mary Davis); Aaron Edwards (Buck Fanning); Carl Ullman (Owen Thorpe). SYNOPSIS: Tom Lowry is the owner of the great Bar Z Ranch, and a sort of king of the wild desert country. A strong, grim, silent man, quick on the trigger, terrible in his wrath, and a bitter and implacable enemy. There is only one fly in his ointment; a settler has dared to take up a claim in the valley, and when the news is brought to Tom, he immediately sets off for the cabin to drive the intruder out of the county. Mary Davis has come West to make for herself a home, and to hunt for Owen Thorpe, her sweetheart, who has come West two years before to seek health. She it is who confronts Lowry at the cabin door. He is stunned by meeting a woman, who is the prettiest and sweetest girl he has ever seen. The grim, hardened old warrior of the plains has never seen anyone like her before. They become friends and Lowry begins to realize the influence that Mary has on his life. Buck Fanning, the real estate agent who sold the claim to Mary, visits her, and makes coarse and violent love, and a struggle ensues. Lowry, on his way to visit Mary, arrives in time to save her, and gives Buck one minute to live, but is persuaded not to kill him by Mary. Lowry is wounded by an unexpected shot from Fanning, who makes his escape, and Mary becomes his nurse. When Lowry recovers, he is not only very grateful but very much in love. Mary's hope and courage are gone. She is alone in the world — "at the end of her rope." She has given up hope of finding Owen. And Lowry is strong and a refuge, and she decides to marry him, and the news goes out over the country. Lowry accidentally meets Owen Thorpe, who Mary has told him is her half-brother, and brings him home. Mary still loves him, and they decide to run away to escape the terrible wrath of Lowry. But Lowry discovers the deception and insists that Mary live up to her bargain to marry him, Lowry. The lovers agree to sacrifice themselves, and the wedding arrangements continue. The countryside gather on the day of the ceremony, and at the last minute Lowry leads Mary and Owen to the minister, and announces that they are the ones that are going to be married, which is a great surprise to everyone. Lowry leaves, alone, during the evening celebration, after deeding his entire ranch and holdings to Mary, leaving a note in which he says that he will go to Alaska. LW3298: 9600 dpi jpeg from original lantern slide purchased 2018 by Leon Worden.